In a world twisted by dark magic and despair, supernatural creatures rule from behind the scenes. Vampires pull strings in their deadly games while werewolves roam the woods. Mere mortals are playthings and puppets - until they decide to fight back. Some people know the truth, and they plan to make a difference, to save humanity from the hidden darkness. Even vampires fear The Inquisition, and the government's Special Affairs Division of the FBI is as dangerous as any supernatural enemy. 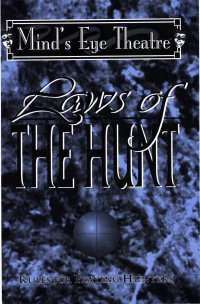 Now, in Laws of the Hunt, you can take up the hunter's mantle and discover the perilous razor's edge of a mortal enmeshed in a supernatural world. Bring a new angle to live-action games, with mortal hunters updated from the Antagonists rules, and the addition of new sorcery. It's time to save humanity.